I think I've identified what I'm missing from the judges - something Simon Cowell was really good at - describing how the audition went in an interesting way, both good and bad. American Idol tonight visited the "Entertainment Capital of the World" - Los Angeles, California - and I must say, it was such a waste of my time. I feel like I lost 1 whole hour to nothing. Nigel Lyhgoe, what the hell man??? First audition by Victoria Garrett "knocked their socks off" and was voted Yes to going to Siberia by Steven Tyler. Tim Halperin sang and it was like no one really noticed that he sang, but eventually they did give him a review. I wouldn't have let him through he wasn't good enough. They didn't show if Justin Carter got through. He looked promising though. Daniel Gomez kept referring to himself as having the star quality but sang terribly. Karen Rodriguez had very clean runs. Very clean. She looked the part too. Definite yes for me. Unfortunately for her, with about 90% of the episode showing bad to terrible auditions, she'll be more likely forgotten by next week. Belly Dancer Heidi Khzam sang Superwoman on key and in tune, but lacking any sort of strength and power. She got through. Well, compared to the others, she should have gotten 2 golden tickets. Matt "Big Stats" Frankel sang? I didn't recognize the song. He kinda sounded like a woman and he looked like a mafia sidekick. 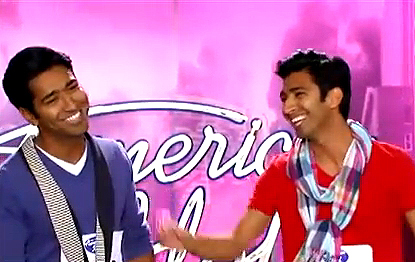 Mark Gutierrez and Aaron Gutierrez sang "Lean On Me" as a duet and was described as "godlike" and "unreal" by Steven Tyler. Seriously Steven? It wasn't THAT good. They should have been asked to sing separately though before they decided. But then again with the way the auditions are going, they'll still both get through. 59 year-old Cooper Robinson ended the show in a really awkward way, shouting around, dancing around and just being odd. What the heck was that Nigel??? Are there no good singers in Los Angeles??? Hopefully things will be better as next week it will be the San Francisco Auditions and then Hollywood Week begins!